Peel and roughly chop the garlic and ginger, then place in a food processor with the hoisin sauce, soy sauce, five spice, sesame oil and a good pinch of sea salt and black pepper. Blitz until smooth. Place the ham on a board and trim off the outer layer of skin, leaving a 1cm layer of fat behind. Score the fat all over in a criss-cross pattern, making sure you don’t cut down into the meat itself. 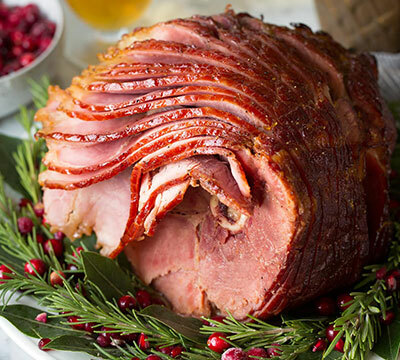 Pick the rosemary leaves, scatter over the ham and finely grate over a little nutmeg. Place the ham in a roasting tray and pour over the marinade. Rub it all over the meat, getting into all the nooks and crannies, then cover with plastic wrap and place in the fridge to marinate for at least 2 hours, but preferably overnight. When you’re ready to cook, preheat the oven to 180°c and take the ham out of the fridge to come up to room temperature. Remove the plastic wrap, halve and deseed the chilli and place on top of the ham, along with the cinnamon and star anise. Halve 1 orange and place in the tray with the ham. Cover the whole tray with tinfoil and cook in the preheated oven for 45 minutes. Remove from the oven, take off the tinfoil, drizzle over the honey and carefully squeeze over the juice from the roasted orange halves. Finely grate over the zest from the remaining orange and squeeze over the juice. Scrape up the sticky bits from the pan and mix well with the juice to form a glaze. Brush the glaze all over the ham and return to the oven for 20 to 25 minutes, brushing and spooning over the glaze every 10 minutes or so, until dark, sticky and gnarly. Once glazed to perfection, remove to a board to rest for 30 minutes before carving into nice thick slices. To get an epic spicy sauce to drizzle over at the end, squeeze a little orange juice into the pan after you’ve removed the ham. Cook over a medium heat, stirring continuously until you have a nice sauce. Pour into a jug, skimming away the fat and serve with the ham.